Elite Envelope and Graphics is the only envelope converter and envelope manufacturer in greater Boston. Since 2003 we have been serving hundreds of businesses throughout the region providing plain, printed, converted and specialty envelopes of all types. In most envelope companies, Adjustor/Mechanics are usually spread over several machines. At Elite, each of our Adjustors handles only one machine which means a greater attention to detail and quality. We also employ the finest and most experienced Adjustors around. Additionally, most envelope companies will have operators who are in charge of taking the envelopes off the folding machine as they are made. This is their only job. At Elite, we have no operators. Our Adjustors are not only setting up the jobs but are monitoring each box as it comes off. This is why we have very few quality problems on any envelope converting jobs. Because of the close scrutiny we provide for each job, we can do things like envelope converting containing variable data which many other converters will not do. We still employ hand-cutting of paper for greater flexibility and accuracy. We have a programmable paper cutter for the larger jobs but many of our jobs are still carefully hand cut by the son in law and grandson of our “Cutter Emeritus” Luis Sousa (picture above). After cutting paper for over 40 years, Luis retired in 2015. But he passed along his great skills to the next generations of his family who we are proud to employ. We know what we’re doing and we’re FAST! You'll get quick and knowledgeable answers to all your questions on envelope converting and envelope manufacturing. For our customers this means that for the tough jobs; where accuracy and a high level of quality is required, Elite is your wisest choice. .
Manufacturing - When it comes to envelope manufacturing, Elite can make all standard and special sizes from 3 1/2 ” x 5” through 10 x 13" for booklets and 12-1/2 x 15" for open ends – all commercial sizes from #6 ¼ through #14 including remittance-style envelopes. We make all kinds of special size envelopes including A-style, baronial, and bang-tail as well as special windows. We have hundreds of die sizes in stock: side seam and diagonal seam. Converting – Elite provides envelope converting services for all sizes per above. We will convert your sheets or can supply stock either printed or unprinted. We can convert up to 65# cover weight on commercial sizes and up to 80# cover (depending on thickness) on large booklet and open end sizes. 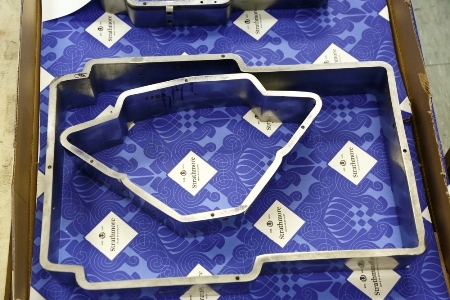 We’ll work with certain hard-to-fold or handle stock such as coated 2 sides, translucent and bag kraft. 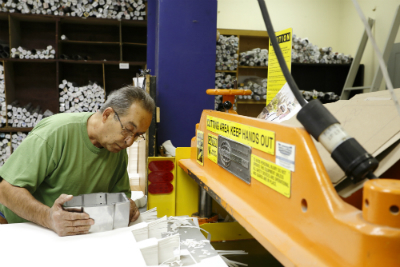 Specialty/Bindery items – We provide tabbing, banding, perforations, hole-punching, die cutting, and shrink-wrapping. We can also add peel and seal and latex seal to envelopes. If you would like to discuss your particular project or needs in general, please e mail me Jerry@eliteenvelope.com and I’ll be happy to assist you any way I can.